If you offer staffing services, then this template is for you. Feel free to use it as-is, or change the layout, theme and font to suite your needs. To get started, replace the logo on this page with one of your own! Thank you for your interest in retaining [Sender.Company] as your provider of staff hiring services! I am very excited to work with you to support your staffing needs. As you are well aware, keeping a growing company fully staffed with the right employees is extremely important. I want you to know that I am personally dedicated to ensuring that your needs are met. This document is a proposal for staff hiring services based on our previous conversation. In it, you’ll find information regarding [Sender.Company], our services, and our pricing for staff hiring services. I encourage you to take time to review this proposal and discuss it internally. If you agree to the scope of work and pricing and are ready to proceed, just sign this proposal electronically and we will get started right away! [Sender.Company] is a full-service employment agency specializing in meeting the staffing needs of companies in the [Customer.Industry] industry. We diligently recruit, screen, and process employees for several local companies, and provide temporary, temp-to-hire, and permanent employees based on customer needs. We help our clients focus on their business by providing a turnkey staffing service. We handle all of the work associated with finding and screening candidates for your openings, and even handle payroll for temp and temp-to-hire employees. [Sender.Company]’s clients know that their positions will be filled with highly qualified employees, and that peace of mind allows them to focus on operations. Temporary staffing is a great solution for those companies who need a flexible workforce. If your operations are seasonal or you take on short-term projects on a regular basis, temporary staffing can allow you to operate at peak efficiency regardless of your workload. We maintain a deep roster of potential temporary employees who are pre-screened and ready to begin work on short notice. This allows you to scale your staff number up when you need it without having unnecessary personnel costs when things slow down. Many employers have spent dozens of hours screening, interviewing, and training a new employee, only to find that they’re not the right fit for the company once they’re hired. This can lead to problems throughout your company as lack of productivity and poor morale build. [Sender.Company]’s temp-to-hire services allow you to avoid the hassle associated with finding and screening a candidate, and also gives you a probationary period so that you can be sure your new employee is the right fit for your team. During this probationary period, [Sender.Company] handles payroll for you, so that you only have to complete internal onboarding processes when you’re sure you’ve found a perfect fit. When you have an opening in a position that’s mission-critical, it’s important that you find the right individual as quickly as possible. When you’re responsible for running your entire business, it can be difficult to find the right person, and a quick decision can lead to the wrong hire. 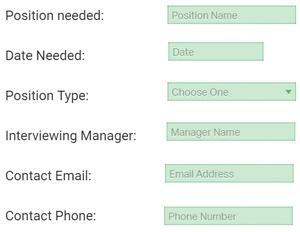 [Sender.Company] is always on the lookout for outstanding candidates for sales, administration, management, and technical fields. When you have an important opening to fill, we can immediately schedule interviews with candidates that we’ve personally screened and selected based on your requirements. This allows you to keep your company fully staffed so that you can focus on your business. At [Sender.Company], we pride ourselves on our simple to understand and reasonable fees. While other companies vastly inflate your personnel costs, or confuse you with multiple fees, we charge a simple rate for each of our services. This section is written based on how most staffing firms charge for their services, but you can customize it endlessly to represent how you operate. Modify the table, add more tables, or delete it entirely! PandaDoc is flexible so that you can build a document that is unique to your company. Temporary employees are billed at a simple hourly rate based on position. Temp-to-hire employees are billed at temp rates during the probationary period, and are subject to permanent employee rates if a client chooses to retain them once the probationary period ends. Permanent Employees are subject to a one-time fee equal to [Permanent.Rate] of their expected annual wages. There are no contracts or commitments required to work with [Sender.Company]. When you have an opening that you need us to fill, simply contact me via email or phone with the details and we will get to work finding the right employee for you. Your electronic signature of this proposal does not indicate a commitment by you, but simply documents that you’ve received the document and are aware of our services and fees. At the end of the document, you’ll find an optional form should you have an immediate opening you’d like my help with. Once again, thank you for considering retaining [Sender.Company] as your staffing hiring services provider! I look forward to supporting your needs. Have an opening? Fill out the form below! PandaDoc’s input fields allow you to do more with your documents. Electronic signature means your clients can sign your proposals on their computer or smartphone, and you can create name, date, initial, checkbox, and dropdown fields to build custom forms. Designate which fields are optional or required to make sure your documents are fully completed.